Grip Digital announced that they would be bringing IOS hit "Jet Car Stunts" to the PS Vita way back in March. Well here we are in October and we are but a week away from Jet Car Stunts release on the PS Vita on October 7th in the US and 8th in EU. 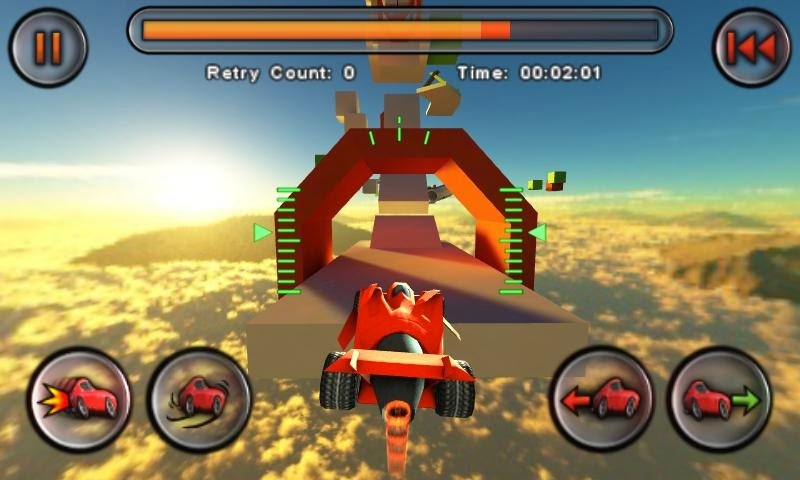 In Jet Car Stunts players will be tasked with racing Jet Cars across 36 increasingly difficult maps. Each map will feature several different challenges to send players to a fiery death, such as platforms, spirals, and blockade walls. The game will also feature 3 different game modes, even though the initial press release only mentions puzzle mode. We imagine the other two are time trial and competitive. Jet Car Stunts will launch on the PS Vita and PS3 next week, and the PS4 launch will be at a later unknown date. Although unspecified, it is assumed the game will be cross-buy between the PS3 and PS Vita. However because the PS4 is launching on a different date it is hard to say if that would be included in the cross-buy or not. Either way this is all speculation. What we do know is this game will be on the PS Vita in just a few days.